The first time I saw a pig in a cage... I knew immediately that this was wrong. I didn't need to check with an "authority" or anyone who might explain (or excuse) why that pig was in a cage. Without the help of words my mind clearly saw this pig as a victim. Foolishly, I thought at first, that there must be "laws" against this sort of captivity of an animal. Then I discovered this one guy wasn't the only "one"... That there were thousands, billions more, also being confined. Suddenly I had a total awareness of "flesh-growing" and "meat-eating". It was like as if someone poured the whole core of truth instantly into my head - And I knew in that moment that I'd fight the rest of my life to undo this terrible wrong. Of course in order to fight more, I had to learn more. And feel more. And one of the hardest things for me was to own my zombie-like participation at the meat cases... It meant I had to remember how I pawed through the packages looking to find that "pretty" piece... The veins, the marbling, the fat... It all escaped me then that it was dead tissue I had been examining. "Killed" dead tissue by my order. Yeah my ignorance was firmly rooted in indoctrination... I never really thought about the process or the numbers. I guess in my mind I thought there was some one animal somewhere: One pig. One chicken. One Cow... And one sacrificial lamb that provided all the meat everyone was eating. And that was only after he/she died of old age... Or at best was "put to sleep" with a painless needle. So now that I've confessed how really dumb I was - I will also say this: My brain and rationality have always functioned just fine! Given the correct information I'm quite capable of sorting out logical conclusions. But there are things that we're conditioned not to see and therefore not to question... The "carcass" on my plate was invisible to me... The "answers" to unasked questions provided every distraction to remain unseen. But then there was that one caged pig and this opened up a flood-gate of previously obscured "cold hard facts" and "data" about the fattening and slaughter of "food animals". We've all been there haven't we? While learning about "factory farms" the number "10 billion" takes on new meaning. How much water and crops it takes to grow them... The 75% of antibiotics they are fed... We even learn of the bazillion gallons of "stored" excrement. This "sticker shock" was my initiation. I guess my point here is to pay tribute to that one caged pig... And to the one person who took the photo... And the one person who placed it somewhere on the web where I found it and connected to the larger picture. Sincerely I hope that someone else will see it too - Really "see" it! And do whatever they can to make someone else see - And so on. For surely, if it is unbearable to witness and know about the one - What of the holocaust of numbers that are a reality? Still not moved? Watch Earthlings and broaden your view. I was just as blind, brainwashed, indoctrinated, programmed, desensitized as you were, Bea. And for wayyyyyy too long. 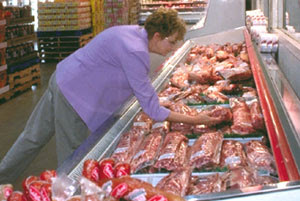 I don't know that I EVER connected live animals with the cellophane-covered packages of wings, thighs, breasts, loins, and legs in the grocery store. How is it that I never asked myself (or anyone else) where these parts came from or, more precisely, WHO they came from? I just didn't know better. No one brought up the subject in front of me. And, for the longest, I wasn't ready to question society's customs. They were so solidly laid, brick by brick, and so firmly sealed with thick mortar. I'm glad the universe of LOVE didn't give up on me in my "lostness." I'm grateful I was given an opportunity to see -- to find my way not with my physical eyes, but with the spiritual discernment and moral integrity that is true vision. Once I knew the truth, it was easy to act. I mean, how could my heart not go out to the dear animals? And not just to "food" animals, but to all creatures. And not just to all creatures, but to the humans who are still as blind and brainwashed as I once was. What is not so easy for me is to accept the excuses of those who are NOT oblivious, who are WITTINGLY complicit in the killing and other cruelties, who DO understand the sweetness and goodness of our fellow-beings, and who CONTINUE doing wrong, with nary a twinge of conscience. What is especially hard to swallow is how many otherwise-compassionate people pretend to be offended when their duplicity is held up to the light by reformers. "Stop being self-righteous," they'll say, not aware that *they* are the ones who are self-righteously -- and self-justifyingly -- buying butchered beings, thus condoning a culture of barbarism. And yet to be peeved with them is not the answer. Peevishness won't help that one pig -- or billions of them. Nor will it save any animal from being oppressed or any human from acting like an oppressor. ~ LOVE doesn't play politics. ~ LOVE doesn't make fear-laced or indifference-based personal choices. ~ LOVE doesn't possess or excuse unloving conventions and customs. ~ LOVE doesn't cover up wrongs, look the other way, ignore. ~ LOVE doesn't take the most convenient route. ~ LOVE doesn't confine in captivity and kill the objects of Her affection. Rather, LOVE revives, restores, renews, releases, refines, rescues, and reclaims the lost. 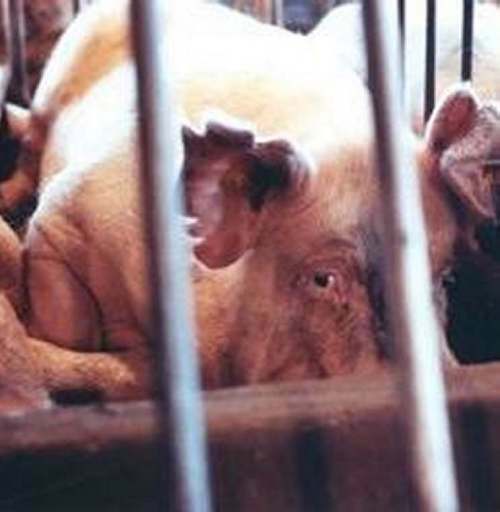 Only LOVE will pull down the bars of the battery cages and gestation crates -- but only after LOVE first removes the bars that block the lifeblood of honesty, humility, justice, mercy, grace, receptivity, and tender-loving kindness from reaching and beating in and opening wide each pure heart. I thought that was very interesting, and the opposite of what I would have assumed. 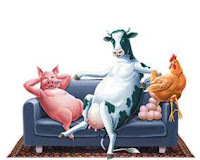 So maybe trying to get people to connect to that one pig, one chicken or one cow is ultimately more effective? HGV is pointing out a salient characteristic of our species, we tend to get befuddled in the face of large numbers, instead a narrative associated with a single individual carries much more possibility of of our identifying with and comprehending. "Once upon a time"...is a much more engaging format with which to grab attention than are references to large numbers. It's a little embarrassing to admit, being as how we tout ourselves as the "crown of creation" and all...but what are ya going to do? I'm currently reading a book titled "Willful Blindness" by Margaret Heffernan that does a fair job of referencing much of the more recent research re the operation of human animal attention. We're functionaly quite blind to much more than than the horrors of what we do to our fellow Earthlings. Anyone taking a look at who we select for "leaders" and what we can be flim-flammed into believing would be hard-pressed to defend our astuteness. We're an example of an animal that is operating in an environment far-removed (in many ways) from the one in which their evolution occurred. That means we have a set of perceptual biasis and set of behavioral responses that will only occassionally fit the circumstances we face. This results in a situation that can be sad, tragic, dangerous, horrific and comedic all at the same time. We are profoundly prone to have our perceptions neurologically altered (unconsciously) by reference groups...we actually do not perceive the world accurately yet think that we do as a result of this tendency in our species. Overcoming this bias is difficult and takes more effort and energy than engaging in group-think but it can be done...however it is hard and the majority of us aren't even aware of the group-think induced perceptual inaccuracy. Pulling away from group perceptions is also anxiety provoking (scary)...and when we get scared we can panic. It is not that many generations ago that humans burnt other humans at the stake because they objected to a common-group think (the sun revolving around the earth). In our lifetime many states had laws against inter-racial marriage because of group-think...we all can think of many instances where group-think operates to warp accurate perceptions of the world around us while ignoring clear evidence to the contrary. WMDs, climate change, environmental destruction, on and on and on. When you consider it, on balance, it is sort of amazing we get anything right. Maybe we would be wiser to figure it is our default position to be in error...that's the norm and any accuracies we eventually stumble onto should be celebrated, cheered and viewed with awe and amazement. The title of a history of our species could be "Real Humans Are Dummies" or something like that. When I talk to people to try to raise awareness I've stopped telling them about all the millions of male chicks that are killed at only a few days old... I just tell them about the "one". I'm hoping this new strategy makes more of an impact. (?) Maybe in the psychology of it all... They can see that they can make a difference to the "one" and do so. We hope. Hi veganelder! I'm reading the reviews of Willful Blindness and it does look like a very insightful study... It's somewhat on the order of Stanley Cohen's States of Denial: Knowing about Atrocities and Suffering. That book too looks at our desire to "not know". Sometimes it's like living on an alien planet with people who look quite like me, but their brains (hearts) operate totally different. Ah... And they have the numbers to *prove* what's "normal" Ugh! In another time both of us would have been on the stakes... I'm hoping the more the world sees that we are prone to gullibility and error that this will "enlighten" us that we're really not "all that" at all. I think we have to first be humble, in order to be objective in order to be smart... Yep ARROGANT "Dummy Humans" *R* Us. Our experiences are so similar - as are most of us vegans' I guess. I struggle with the guilt I feel about the fact that I thought of myself as an "animal lover" and yet for 41 years I was anything but that. I was a "vegetarian" most of my adult life, but I used products that had been cruelly tested on defenseless captives. I ate milk, cheese, eggs without a second thought. I didn't buy leather specifically, but I had plenty of things made of leather. Had cat toys made of rabbit fur and feathers. All without a second thought. There was one cow (she's featured on "Have Gone Vegan") who sort of adopted me as her friend and she is the reason I finally, finally after all those years, got it right. I couldn't save her from her fate, but she was my friend and I owe her a lot. Your tribute to that one pig in that one photo and the one who took the picture is beautiful. ... The only animals who belong in cages are human beings who kill or hurt other living creatures for food or 'pleasure'. I don't have time to read all of the other comments right now, but HGV's also reminded me of something I've read about called "the by-stander effect". As written, it has applied to humans not helping each other in life and death or severe harm situations and just standing by and watching it happen. And that there are often large crowds standing around and unless one person steps up to help, everyone will just stand around watching any kind of atrocity. But that it takes just one to step up and then others will help. It's a high mountain to climb, but if we all keep helping, one at a time and together, maybe we can change the by-stander effect that is killing and torturing all the defenseless sentient beings we share this world with. I know the story of your special cow... And how she allowed your mind and heart to connect with the entire ruse before us all... As my pig did for me - I'm glad she did for you! And regarding that "by-stander effect" I saw a video awhile back that supports that claim too. It centered around a crowd in which one person got up and danced - Nothing happened... But when the second person joined in so did the third, fourth, tenth and so on. The first person "leader" is critical for sure - But it is the second one who follows that ignites the group.